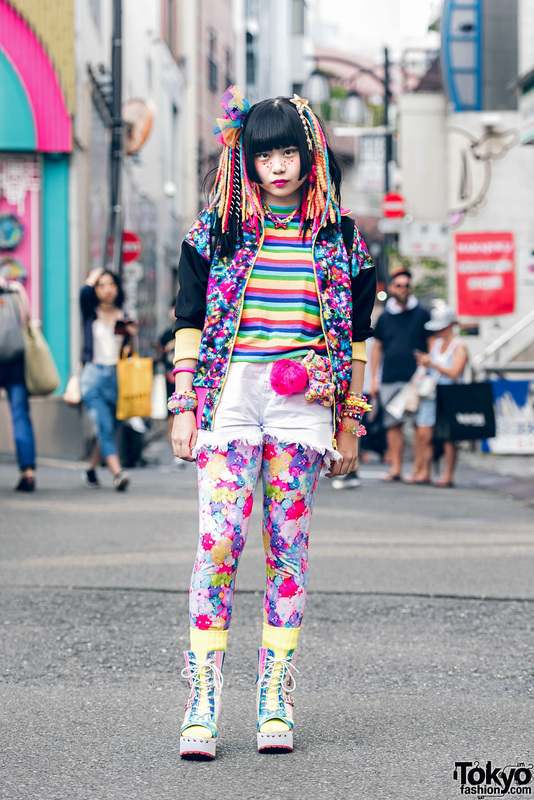 Harajuku girl in kawaii and mixed prints fashion with printed jacket over striped t-shirt, frayed shorts over printed tights, socks, platform lace up heels, lion backpack, beaded necklaces and bracelets, and hair falls. Harajuku girls in black/green and white/pink fashion wearing long sleeve mandarin collar tops, shorts, sheer skirt over short skirt, fishnet stockings, black boots, white platform boots, and panda backpacks. Harajuku kawaii girls in colorful street fashion wearing printed jackets, satin shorts, printed skirt, tights, rubber sandals, printed sneakers, backpacks and decora accessories. 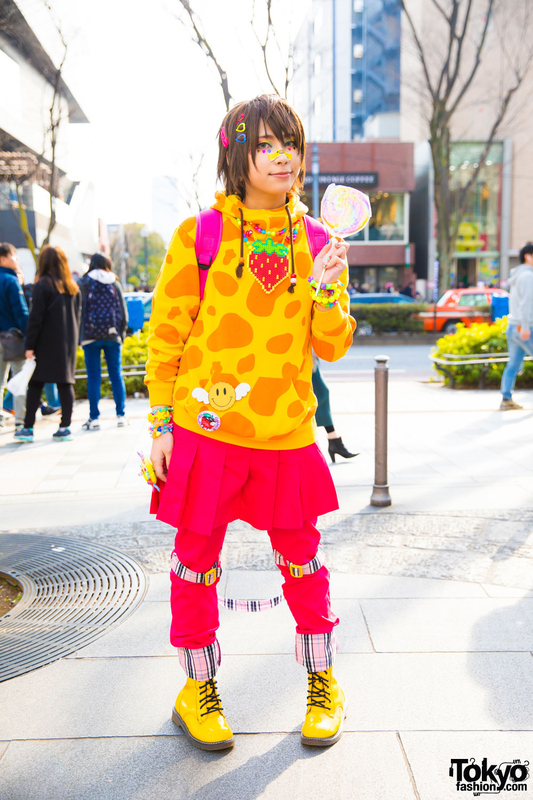 Harajuku girl in decora street fashion with yellow hoodie, pleated skirt over pants, pink backpack, yellow boots, and decora accessories. Japanese idol with pink hair wearing a telephone sweatshirt with loose socks, and My Melody bag, Hello Kitty mask, and Duffy bear backpack. Harajuku girl in all white, twin tails, bunny backpack & bows vs. Harajuku girl in black, corset piercings, glasses & sneakers. 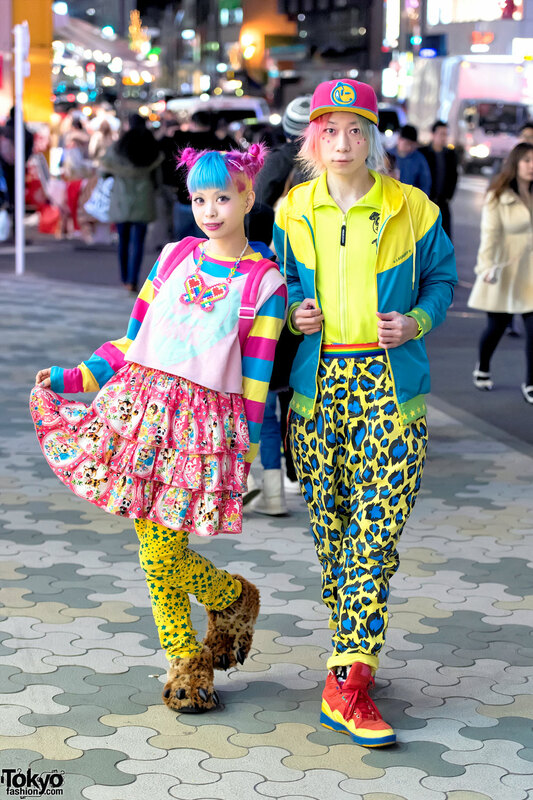 Japanese kawaii model Haruka Kurebayashi and Harajuku Fashion Walk organizer Junnyan on the street in Harajuku wearing cute fashion with colorful hair and fun accessories. Harajuku girl with pink-purple hair wearing an oversized jacket with a hoodie, platform shoes, Duffy backpack, and kawaii accessories. 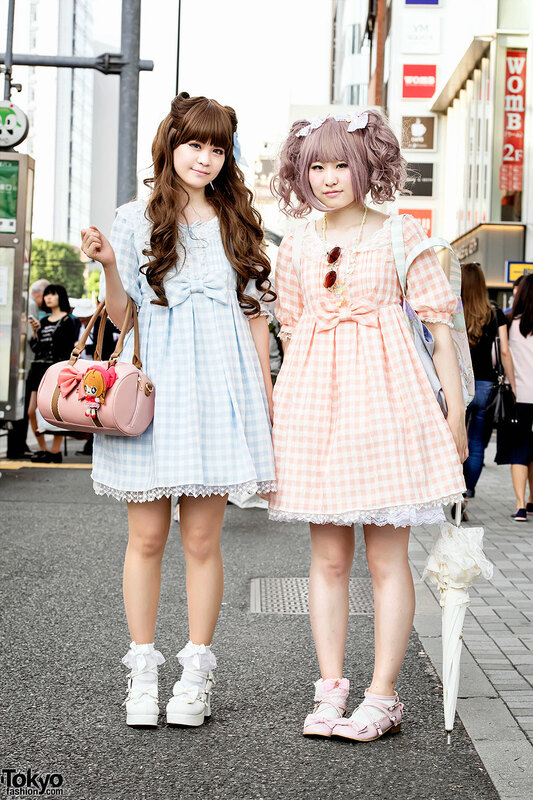 Harajuku lolitas in matching Angelic Pretty gingham dresses along with items by Baby The Stars Shine Bright and Cardcaptor Sakura.